Augmented Reality: Do Smart Glasses Herald the End of the Smart Phone Era? Computerised glasses are, at this moment, the wearable computing technology that is most likely to herald the beginning of the end of the Smartphone era. Although they are each taking slightly different approaches to these technologies, Apple, Google and Microsoft are all striving to define the market for wearable computers of which computerised glasses are an integral part. The US military, especially the Special Forces units, already use wearable computers for communications and satellite navigation tasks. That technology hasn't yet reached consumer or business users, but it soon will. Smart glasses are due to be launched selectively in the New Year. Ever smaller and ever more powerful mobile technologies are evolving like the new moves of a techno-dance where nobody is quite sure how to respond. The concept behind the computerised glasses is "Augmented Reality" or AR and it enables people to view data and images displayed on the special lenses and also look through the glasses to view the world around them. AR supplements -- or augments -- a user's view of reality via information provided on a heads-up display. AR is familiar to fighter pilots who see their speed, altitude and the position of their wings displayed onto their visor and to moviegoers who saw through Arnold Schwarzenegger's eyes his progress as the "Terminator". The ambition with computerised glasses is much bolder, though: in effect, an augmented brain. They typify all the miniaturised gadgets we used to see and think about in relation to science fiction novels and movies including "Star Trek" and "Star Wars". The idea of highly mobile and highly powerful wearable computers is extremely intriguing and at the heart of newly emerging trends including bionic "Six Million Dollar Man" type powers which could fundamentally change the way we live, work and play, yet again! Google's computerised glasses -- Project Glass -- have already been spotted in the wild and their functionality is being tested. Google is offering prototype versions of those computerised glasses -- Google Glass Explorer Edition -- for US $1,500. The first Project Glass products -- Google's network-enabled computerised glasses -- are set to ship to a select group of enthusiasts and developers early in 2013, according to Google's co-founder Sergey Brin. Fashion Accessory or Workplace Essential? A few months ago, Google's computerised glasses found their way onto the faces of super-models during Diane von Furstenberg's New York Fashion Week show. Sergey Brin walked arm-in-arm with von Furstenberg after the show and said, "Beauty, style and comfort are as important to [Project Glass] as the latest technology." Outside the realm of fashion, Google Glass and other wearable computers may be very useful in many workplaces, and not just the next big thing to help users look geeky or cool. They could be used regularly for taking inventory in warehouses, for tasks on factory floors, and other working environments like operating theatres and dentists' chairs where professionals need to use computers and their hands at the same time. Project Glass comes from Google's ultra-secret X Labs team, which is responsible for fringe projects like the self-driving car and other esoteric projects. The glasses are powered by speech. If one wants to check into a location on Google+, for example, one could just tell the glasses to do that. 6. Eye-tracking functionality by way of additional sophisticated control input. 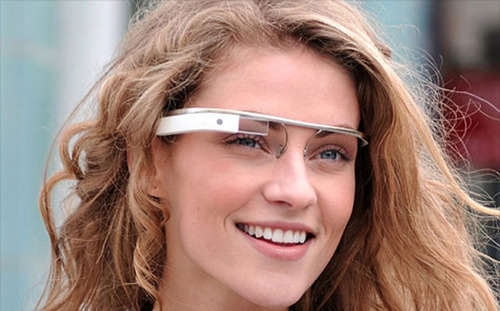 Google's ambition with "Project Glass" is much bolder and they seek in effect to create an augmented brain. As one of the project engineers said, "Someday we would like to make this so fast that you don't feel like, if you have a question, you have to go seek the [answer]. We'd like it to be so fast that you just know it. We'd like to be able to empower people to know information very, very quickly." Google believes that the computerised glasses are ideal for capturing a first-person view of the world, such as spontaneous photographs people would miss if they had to take time to dig out a camera. Google considers "baby pictures" a perfectly matched use for Project Glass. Babies look at faces, so it's a more natural interaction and makes it less difficult to catch that elusive early smile. Isabelle Olsson, the Project Glass lead designer, says, "The baby looks into the mom's eyes, they connect. While doing that, she can capture this moment without any distractions." Computerised Glasses fit into an obvious pattern. Computers have been getting smaller, more intimate, coming ever closer to our faces since their very beginning. First they were in big rooms manifest as mainframes. Then they sat on desktops as personal computers. Then they sat on our laps as laptops. And now they are in our palms as Smartphones. Next they will be on our faces as computerised glasses. Eventually, they will be in our brains communicating via our thoughts. If it comes to pass, computerised glasses could be the next big thing in personal computing, beyond Smartphones, assuming that people find them useful and effective. The rough schematics of Apple's "computerised glasses" project have been publicly available on the US Patent Office's Web site since this summer. In the patent filing, Apple calls the gadget a "Head-Mounted Display" or "HMD." Some highlights from the description suggest that HMD is "a display device that a person wears on the head in order to have video information directly displayed in front of the eyes... The optics are typically embedded in a helmet, glasses, or a visor, which a user can wear... HMDs can be used to view a see-through image imposed upon a real world view, thereby creating what is typically referred to as an augmented reality." HMDs can be used to "Display relevant tactical information, such as maps or thermal imaging data... to provide stereoscopic views of CAD schematics, simulations or remote sensing applications... for gaming and entertainment applications." Imagine a gadget that features applications for maps, games, and millions of other uses? Sounds very familiar! Such new computing form factors are an extension of the current mobile trend, taking satellite-navigation enabled Smartphones, growing miniaturised computer power and multiple new communications capabilities to the next level. Wearable computers are likely to be a big step towards a new generation of computing that can also be embedded inside the human body. Putting aside visions of Star Trek's Borg initiative, wearable computers are a bridge to the first such computer implants. All of this is clearly an interim step toward embedding computers into people and creating some kind of biomechanical interface that bypasses the eyes and other human sensory mechanisms like the ears and finger touch. The fully trans-humanist computerised generation of human beings may be some 25 to 50 years away. However, the accelerating transition we are now evolving towards is one of the big technological changes we will see in the computing and human-machine interface this century. It will redefine not just personal computing but our lifestyles by the time it has fully matured!